…and thus mankind was finally successful in destroying themselves. The world as we know it is gone, and yet mankind thrives. 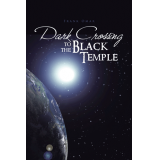 Dark Crossing to the Black Temple tells the tale of two brothers entrusted with the task of escorting a mysterious, catlike stranger to the mythical Black Temple on a planet in the midst of civil war. What stands in their way are the most ferocious killers the universe has ever known, and a soulless, megacorporation whose only interest is expansion. DCBT combines science fiction, humor, adventuring, and philosophy in one of the most poignant popular books today. Join Gnash and Grimm as they travel the galaxy with their friends and attempt to undertake the most dangerous adventure of their young lives; Vaal, a Seraphim whose life has been stolen from him by the notorious Ludovico, wants revenge but first must fulfill his obligation to his father; Rela, a Kater, must make a choice that will impact her life forever; Chaspel Lich, Devourer of Worlds and the most powerful force in the universe, has become self-realized. Their fates have all interlocked because of one woman - Delfyn Dark.